I blogged about a Lego 40004 look-alike last time, but I made a mistake in mentioning the base, I think it should be a Round Dish 6 x 6 Inverted instead of an 8 x 8 I mentioned last time, and the 6 x 6 inverted dish is readily available from a set I just reviewed: 4996 Beach House! So here I have an exact replicate of 40004 built using parts I have on hand. There are quite a number of Lego Valentine gift options, check them out! After I shared my review on Lego Ben 10 8409 (Spider Monkey) at a few forums, I got far many responses than I expected, it seems to me that a lot of people were looking forward to this new theme, but most of the feedback were not really favorable to this new Lego theme, to be fair and trying to take a second look, I opened the second box of Ben 10 set I purchased, and that, is 8519 Big Chill. Among the Lego Ben 10 sets I saw, Spider Monkey and Big Chill look more interesting because the monkey has six limbs, and Big Chill has a pair of wings, the other sets looks simple and feel like containing only a subset of the two I chosen. The head is actually made up of two parts, the screw can be removed to re-position the joint. Honestly these characters looks scary, I don't know them and they can be good guys, but the look scared my young daughter quite a bit. The building process is really simple, so I spent time in playing with it by making a few wierd postures. After playing with Big Chill, I must say again that the flexibility this design provides is really impressive, the joints must be a design work of careful thinking, and if we just treat it as just another Lego product line, and as long as Lego would not "contaminate" other existing theme with this design, can we say that this Ben 10 theme does have some value as a toy? Even if it does not feel that Lego to us? Another question is, with this type of design, aren't there any existing better options than Lego? And the responses I got from polls in Eurobricks as well as a Greater China forum is also very interesting, that would be very helpful in driving thoughts on this theme from different angles. I am waiting for more responses. I found Lego Ben 10 sets on display yesterday in local Toysrus, despite that it was the first time I ever noticed such theme, I purchased two sets to find out what this is all about. The first thing that came to my mind was: another Bionicle? A quick check on the web revealed that it is indeed some sort of successor to the soon-to-be-discontinued Bionicle series, a new theme based on an American Cartoon licensed from a company called Cartoon Network, while I have absolutely no idea on what this Cartoon or Company is all about, I just see some sort of Bionicle feel in it. Another interesting find from the web are some rather negative remarks about this new product line. The first box I opened is 8409 Spider Monkey, among the 6 sets on display yesterday, this seems to be a more interesting one, I was not surprised by the content, as there were already clues on the box, this is not a typical lego set, it is indeed a new twist, big parts that can be used to build a character probably in less than 5 minutes, quite un-lego in a way to me, even Bionicle sets would contain some smaller parts as well as regular lego bricks, but this one is totally different. I guess I can understand why Lego makes such move, the traditional market segment, which probably includes you and me, may be kind of saturated, at this times where PSP, Wii and XBOX rule, Lego needs to identify new customer sources, and I think this Cartoon series very likely has a strong loyal supporter base that will sure purchase good related products. But here in Hong Kong, I think this product will meet cold response, for around 10 minutes in that crowded store, no one except me barely care to pick up a box to check, and there is so little discussion about this in local forum (well, I may try to test water with my Chinese review later). So is the product really that bad for me? Honestly, as far as this 8409 is concerned, it is kind of interesting, the color is nice, and the creature can be played by making different postures with a lot of flexibility, I even would imagine using the parts on future MOCs, I think the parts are Technic compatible just like Bionicle. I tried turning this into a Spider-like posture and it works! Overall, getting one or two good sets from this theme is fine, even it can be a little overpriced, at this price range it is tolerable, but it is definitely not something to feel excited about, at least not for me. In fact, this kind of design concept based on big parts is very unlike the built-from-details design philosophy that I see in Lego, I hope this type of design is limited to this theme and will not spread to other themes. I was very excited to see this impressive creation from Audi, who is a Taiwan based Lego artist. 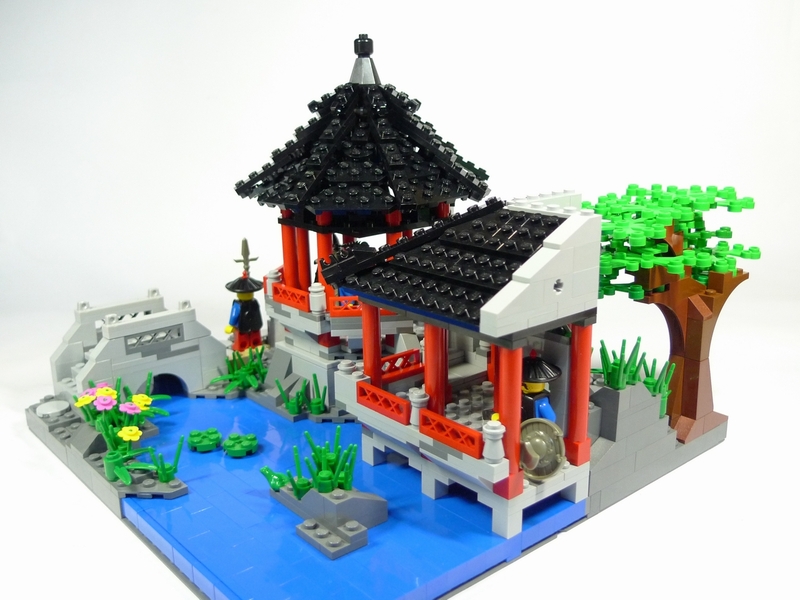 It proves again that Lego can be used to come up with Chinese style creations even if such theme does not exist yet. I know that it would take a bit of ingenuity and inspirations. Being able to pack so much details into a 32 X 32 space is truly impressive, this work depicts the garden of a noble family in Ching Dynasty, while the pool, bridge and the guards are all nicely crafted, the roof of the small pavilion (涼亭) is particularly interesting and requires special technique to achieve. I would seriously suggest everyone to check out Audi's blog for more details, as well as his other wonderful creations. When news about Lego 40004 Valentine Heart came out, some folks at a Greater China forum obviously feel envy because the product is not available at this region yet (I think it should come very very soon though), since it looks quite simple, I think it would be easy to emulate, fortunately almost all parts are available on hand (almost, except one...), I instantly give it a try. Easy, right? Not exactly, the white dish is only a 4 X 4 Inverted while in 40004 I believe that the one used is a rather rare 8 x 8 Inverted Round Dish, so this copy is not really exact. But nevertheness, it works, and there was a happy recipient of this Lego valentine heart. My personal feeling is that the Lego design is a little bit plain, so I try a couple more variations, and .... what do you think of the followings? By the way, this year's Valentine coincide with the first day of Chinese New Year, is it a good thing, may be, or may be not, it is always not easy to handle two things at the same time. With so many hot discussions around the new Lego 2010 Harry Potter sets, it reminds me of the few Lego Harry Potter sets I have owned. Honestly I am not a fan of Harry Potter, I don't even know much about the story and never watched any of the movies, I bought a few Lego Harry Potter sets simply because of the Lego elements in them, and I actually got them only around an year ago, in reasonable pricing luckily (I would not have got them if too expensive), I think such pricing is not possible nowadays any more. One of the set which I have actually built is 4704 - Room Of The Winged Key, it is a nice small set, the old gray parts and tan color mix well, and I would say the elements (spider and web, flames, keys+wings) all works well together. The architecture is good, nice design integrating the arch, roof, door and having the two plates hinged together nicely, which added a little playability aside from the minifigs and keys. The minifigs are wonderful too, with wands and capes (star pattern), the all white queen minifig (if you count it) is also interesting, I think the white torso with white hands is not very common and can be quite useful (please correct me if I am wrong), the chrome silver crown is available in very few sets too. The old sets seems to include quite a few nice extras, in the case of 4704, there are two nice small posters! There are also a number of other useful parts in it, mainly "winged keys" of course, but I don't think I would break up this set and use the parts else where, I better keep them intact in one set, perhaps only temporarily "borrow" a few items for external deco in an MOC, and will return them to the set afterwards. Another interesting thing in playing with this set is how to break down the built product into components that can be easily re-assembled, and keep them in the original box, usually this is difficult for most Lego sets, but this one seems to be working well. Looking forward for the new 2010 Lego Harry Potter sets, not for Harry Potter but for the high quality lego design associated with the theme. During Chinese new year (農曆新年), a popular floral decoration is narcissus (水仙) as it symbolize prosperity, the deco would look excellent if the flower blossoms well at the right time, with some parts that I have on hand, I tried to create a Lego version of narcissus, and it looks kind of interesting to myself. I hope you'll like it too. I found out about this DK Lego sticker book from Brickset, and fortunately it is available at a local store at a good price, I did not hesitate to get a copy, and it looks like a good deal to me. The booklet pages are quite simple, but in a way it reflects what the editor feels would be the representative set of a theme, in Starwars, it is 10143 Death Star II. But I think they can actually make the booklet pages even richer. - 19 pages of "Extra stickers, 4 of them are smaller size ones, aside from having a second set, there are 2 pages which are new (not available in the booklet related set). These extra stickers are supposed for free use beyond the booklet pages. There are 150 small stickers on each page. In total, there are 512 regular stickers and 600 smaller ones. The value of this book lies in the stickers, how to use them can imply a lot of possibilities, but would it be attractive to mature brick builders? I guess that would be interesting. By the way, as the news from Brickset mentioned, there seems to be a Lego Star Wars version of DK sticker book coming (Lego Star Wars Ultimate Sticker Collection? ), as there are some early information at borders.com.au, if that is true, the Starwars version can probably be a even hotter item!